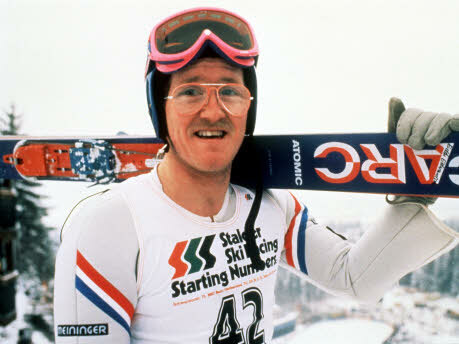 I've had a problem with our stuffy, self important Winter Olympic Ski Committee ever since they decided that Eddie the Eagle had made them a laughing stock and the enthusiastic amateur no longer had a place in our Olympic team. In fact, not only did I think at the time that this happy go lucky cheerful bloke characterised what the Olympics should be about but I thought, "We should embrace this and send anyone who wants to have a bash." We're not bloody Switzerland so lets stop pretending and do what we do best, just have a go. Of course, that does something of a disservice to Eddie who was a fairly accomplished downhill skier and only took up the jumping because he was self funded and the kit was cheaper and qualification easier. Being far sighted and somewhat heavier than the other jumpers didn't help his competitiveness yet added to his appeal to the rest of us. Eddie of course has had the last laugh by being one of the best known Olympians of all time and is held in great affection by people across the world. My own favourites are those other happy losers, the Jamaican Bobsleigh team. So only grudgingly do I switch the television on and watch some of the coverage from Vancouver. Yet I find myself being drawn in. What is there, not to like? I had, mistakenly as it transpires, thought that sport had reached it's zenith with Beach Volleyball in the Summer Olympics but hey, I'm nothing if not open minded. The whole Snow Board Cross and Ski Cross events though have taken things to a new level. It's actually exciting to watch which is a new thing for me. Previously I used to doze off watching Franz Klinger or whoever slip sliding down the slopes with only the clock to race. This has clearly not gone unnoticed by the Olympic bosses who now send them careering down with a flash, bang wallop approach, four at a time, at the speed of greased weasel sh*t.
If you haven't seen it, I can tell you it's not a sport for the feint hearted. My goodness they don't half come down with a clatter and I can't help being reminded of the movie Rollerball. Set in a world without crime Rollerball becomes the World Sport, fast, violent and very dangerous it becomes an outlet for the baser instincts of the audience. I don't want to sound like a lie down and cry liberal but I just wonder if bigger television audiences and sponsorship are worth the inevitable serious injuries that we will result if they continue to race down aggressive tracks like the one we have seen in these Olympics. "Oh no," she said, "she's done her race and she's very busy." Go Mum!